People have no idea what a treasure we have in Princeton with a resource center with so much to offer. I compare notes with friends, and they have nothing that holds a candle to PSRC. Jocelyn Helm and Karin Slaby wrote a grant in 1974 to NJ Dept. of Community Affairs to provide programs for residents of Spruce Circle (senior public housing managed by the Housing Authority Borough of Princeton). This program was later called Tenant Services. Additional funding was received from the County to offer needed social services. In 1976 a board of directors was developed, and in 1979 the Senior Resource Center became a non-profit organization. Funding sources were Princeton Borough and Township and HABOP, with funding split 3 ways. In the 1980s the programs expanded, adding student interns and collaborations with other organizations. With a grant from the United Way, the HomeFriends program started in 1987 as a friendly visitor program, matching homebound elderly with trained volunteers. A director was hired for this program. The board of directors became more active in fundraising. Grants were received from more sources including United Way, and NJ Commission for the Humanities for a program called People and Stories, and from NJ Dept. of Health for a program called As Our Parents Grow Older. In 1991 a grant was received from Mercer County Office on Aging to administer the Senior Health Insurance Program (SHIP) for Mercer County, to help elderly and disabled fill out health insurance forms (moved to RWJ-Hamilton in 2001). Also, there was a corporate grant for printing and distribution of a booklet “Princeton Area Community Resources for the Elderly,” which has been reprinted and expanded every 2–3 years (now on our website). In 1993 PSRC received a grant for a program called Older Adults Transition Assistance which included professional geriatric counseling and consultations, and information and referral (now evolved into Partners in Caring). The Suzanne Patterson building was donated to/purchased by the Borough of Princeton many years ago. It had originally been a gym for Miss Fine’s School (1924–1932), now part of PDS. Suzanne Patterson, wife of the mayor at the time, asked that the building be saved and used as an activity center for “seniors,” loosely defined. The building was dedicated to Suzanne Patterson in 1985, and opened as the senior center for Princeton. Funds were raised by the Senior Citizens Club for the initial renovation. Exercise classes, art classes and large meetings were held there, with a director hired by the Borough of Princeton. 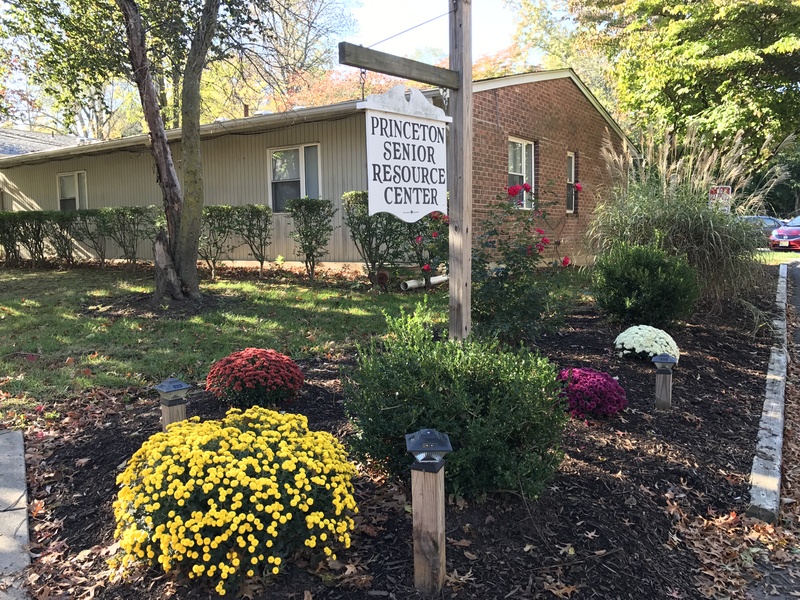 After several years, it was recognized by many that it would be sensible to combine the Suzanne Patterson Center with the Senior Resource Center, thus giving one organization the responsibility for programs and services to all seniors in Princeton, accomplished in 1994. Initially a one year contract with the Township and Borough was negotiated. Funding continued from the Housing Authority Borough of Princeton to continue the special services provided for tenants. PSRC continues to serve the community from these two locations. The HomeFriends program began in 1987, matching adult volunteers with homebound seniors and people with disabilities, with volunteers helping with friendly visits, grocery shopping, reading mail, and other weekly tasks. The LINK (Local Intergenerational Network of Kindness) Program was developed in 1995 out of the former Youth Employment Service. High school students were matched with elderly for companionship. In 1996 Jocelyn Helm retired as founder and Executive director. The new Executive director was Jan Marmor, who had been the Assistant director. That same year PSRC was selected as one of eight pilot sites to help develop accreditation standards for the 15,000 senior centers nationwide under the auspices of the National Council on Aging. In 1997 over 60 community members from Princeton participated in the accreditation self-assessment process, developing action plans for short and long-term goals. Full accreditation by PSRC was achieved in 1998. Out of the accreditation process, a commitment was made to increase publicity to become more visible in the community, and to serve the entire economic spectrum of the community. Accreditation was discontinued in 2012 in favor of strategic planning. Also in 1997 a new program started which was called Grandparents/Grandpartners, with seniors reading with kindergarten children in the public schools. That program is now called GrandPals, expanding into all four public elementary schools. Fundraising events continued to provide more revenue and in 1999 a development consultant was hired. In 2000 PSRC published the booklet, “Alternative Living Arrangements for Seniors,” which detailed information about Assisted Living and CCRCs in the Greater Princeton area as these residential communities proliferated. PSRC continued regular updates to the print “Community Resource Directory for Seniors.” Both have been merged into the online resource directory on our website. In 2001 Evergreen Forum, which was started and is overseen by a dedicated steering committee, began with 4 classes and came under the PSRC umbrella of programs. It is a lifelong learning program for retired or semi-retired people, taught by volunteers. Jan Marmor resigned when she left the area in 2002, and Susan Hoskins, LCSW became the new Executive director of PSRC. Plans were already underway for major renovation of the Suzanne Patterson Center Building, with monies ($500,000) provided by Mercer County and Princeton Borough. The new space was ready for occupancy in Spring of 2003 with new classrooms and office space, new lighting, and new furnishings. After careful consideration, the board decided in 2003 not to seek NISC reaccreditation because few senior centers had undergone accreditation in the first place, reaccreditation involved repeating the entire process, many were not renewing, and it was very time-consuming and expensive. Instead, PSRC created a Strategic Plan to guide the director and board. Mission, vision and strategic issues were identified at a retreat that involved board, staff and members of the community. During the following 3 years, the agency met the objectives set in the 2003 Strategic Plan. The Suzanne Patterson Center became a hub of senior activities and services. It is an active and welcoming community, perceived to be a helpful resource for seniors and their families. Social services were strengthened to provide support and guidance to individuals and families facing life transitions. New Plans have been developed every 3–4 years as goals have been achieved and the environment and population change. We held the first annual Fall conference in 2003. Newspaper publicity increased and PSRC’s monthly bulletin, “Mature Princeton,” (now “Newsletter”) developed into an important vehicle for communication about senior issues and available activities and services. The number of office volunteers grew and we increased diversity on the board of Trustees. In Spring 2004, we opened the “Caregiver Resource Center” to highlight the services given to adult children, spouses and others who care for older adults. The program includes counseling and consultations, support groups, information and referral and a resource library. HABOP reduced funding for the Tenant Services program, due to a reduction in HUD funding, resulting in a focus on case management and social services that support safe independent living and smooth transitions, and a reduction in on-site social events at Spruce Circle. PSRC increased the number of classes and programs which continue today. These included a monthly brown-bag seminar, a movie, and often a special lecture. The director’s message in our newsletter and Prime Time cable TV show (2009–2011) highlighted topics of current interest. One or two large social events and art shows attracted attendance from throughout the community, and we organized occasional trips. A growing number of collaborations with other local organizations provide an ever-changing array of programs to a diverse community and make it possible to offer so much. The PSRC website has become an increasingly important publicity and communication tool, and it hosts the resource directory. 2006 and 2007 focused on improving organizational infrastructure, including creating a new database which holds development, mailing and class registration information, recreating the website, and updating governance (bylaws; policies and procedures; and personnel, volunteer and board manuals). The PSRC website has become an increasingly important publicity and communication tool. We established an endowment for long-term stability of the organization. Staff, board and community created a new strategic plan to guide efforts for the next 3–4 years, including a new mission statement. In October 2006, PSRC was awarded the Community Spirit Award by Princeton Human Services in recognition of our efforts with inclusivity and of seniors. In 2008, PSRC joined with 5 other organizations to establish Partners in Caring, which enabled us to provide a wide array of services to support aging in place, including care coordination, education, meals, transportation, support groups, and more. The last print Resource Directory was published in 2011; it is now on the website. The Engaged Retirement program was created in 2008 to help people make successful retirement plans with an emphasis on civic engagement. With the economic downturn, we added Encore Careers in 2009 to help people re-enter the workforce and in 2011 renamed the program Next Step: Engaged Retirement & Encore Careers. In 2009, PSRC assumed oversight of the Crosstown transportation program, a car service for seniors funded by the Municipality of Princeton. We have also advocated for the FreeB bus service. As the population of adults over age 65 grows and PSRC’s reputation grows, demand for programs and services also expands. The challenge is to balance outputs with resources. In 2012, Partners-in-Caring became the United Aging & Disability Partnership with 9 agencies providing services throughout Mercer County, funded by the United Way. The LINK program was discontinued, although students from Princeton University and area high schools continue to volunteer, especially in the rapidly expanding technology programs. GrandPals expanded to a third school in Princeton and one in Trenton. In 2013 we left the United Way program and started our own PICPrinceton (Partners in Caring Princeton). We also began the Encore Internship program under Next Step and expanded our health education programs under the title Living Healthy. In 2015 the Engaged Retirement program was reduced in scope due to lack of funding and reduced participation. It currently includes monthly lectures in collaboration with the Princeton Public Library, and groups.The Evergreen Forum program grew to 26 classes per semester, with about 500 enrolled. Princeton Borough and Township consolidated in 2013, continuing to contract senior services with PSRC. Attention again returned to capacity building, participating in the PACF capacity survey, updating the strategic plan and organizational structure, and implementing a new data base. The new strategic plan included a new mission, vision, values and goal statement. In September 2014, PSRC celebrated its 40th anniversary with a gala, at which it was announced that Princeton had received designation as the first Age Friendly Community in NJ by the WHO and AARP. A Task Group was formed to develop a Community Action Plan for Princeton. Four focus areas were identified: Housing, Transportation, Communication and Neighborhood Groups. By 2015 it was clear we had reached space capacity at the Suzanne Patterson Building, and that expanding into Monument Hall simply moved the capacity crunch to the parking lot. After using other spaces in town, we moved several classes to the Presbyterian Church of Lawrenceville. Another major focus has been improving our marketing with an identity catalogue for print and digital materials, an annual marketing plan, revision of all print and digital publications, and revision of the website.. The electronic newsletter is sent weekly, followed by e-blasts and Facebook posts. We are also using more online registration. Attention is being given to increasing fund raising capacity. There are currently 7 full-time and 8 part-time staff, 50 instructors, 17 Board members and 15 Advisory Council members. Program areas include: Living Healthy, PIC Princeton (Support & Guidance), HomeFriends, GrandPals, Engaged Retirement, Crosstown, and Evergreen Forum. Approximately 1300 people attend activities and 100 receive support services each week. PSRC’s 70 collaborative partners and 375 volunteers help to make this all possible. Funding comes from a wide range of sources: individual donors (37%), Municipality of Princeton (19%), program fees (15%), corporations (10%) and foundations (4%).